Tom Palazzolo. Photo by Eileen Molony. Tom Palazzolo is a true Chicago original. Filmmaker, photographer and painter are just some descriptions of him. Chronicler of Chicago oddities and oddballs is another, as well as teacher. For more than 50 years, Palazzolo has exposed the quirks of Chicago through his work, from the time he came here in 1960 from St. Louis to the present day. Currently 78, Palazzolo’s photographs are currently on exhibit at the Ed Paschke Art Center in Jefferson Park. In addition, some of his films are being exhibited at the University of Chicago’s Smart Museum in “The Next Generation: Chicago Imagists from the Smart’s Collection” and on March 11, the University of Chicago’s Reva and David Logan Center for the Arts is hosting “A Night With Underground Imagist Filmaker Tom Palazzolo. Palazzolo, now 78, recently talked to The Chicago Ambassador about his career, the current exhibits featuring his work and a film he is working to complete on another Chicago eccentric, artist Lee Godie. 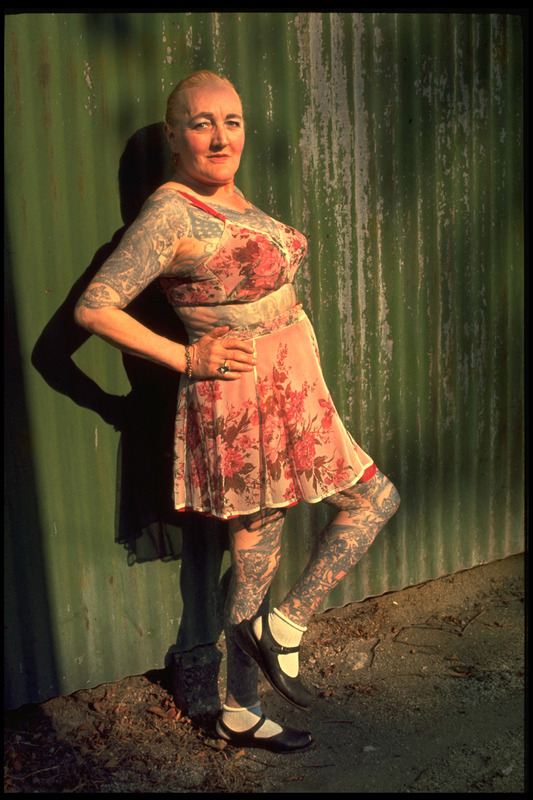 Tattooed Lady of Riverview, 1967. Digital print from a 35mm slide by Tom Palazzolo. CA) You are known for your short films, but you also paint and are a photographer. Do you label yourself as a specific type of artist? How do you describe yourself? PALAZZOLO) I’m kind of a general practitioner and I like experimenting, trying different mediums. CA) You’ve always focused on Chicago and its people. Over the years did you ever consider moving anywhere else or working anywhere else? Chicago has a lot of wonderful photographers and artists and playwrights and poets. Chicago is terrific for cultural goings-on. I think I’d feel lost if I was in a place like New York and even Los Angeles. I’ve never even been to L.A.
CA) Your work, specifically your films, have been shown at the Museum of Modern Art in New York, the Whitney Museum of American Art, the Art Institute of Chicago, the Gene Siskel Film Center. Right now some of your work is on display at the Ed Paschke Art Center in Jefferson Park. Does that have any special significance to you since you were a classmate of Ed’s at the School of the Art Institute in the 1960s? PALAZZOLO) I knew Ed and was friends with him, not to say we got together very often because he was always working. I exhibited with him before he was well known at IIT. I have a picture of him and I at a charity event in my studio. He was a really nice guy and his work was terrific. It’s really nice to be in the art center that’s dedicated to him, surrounded by his work. 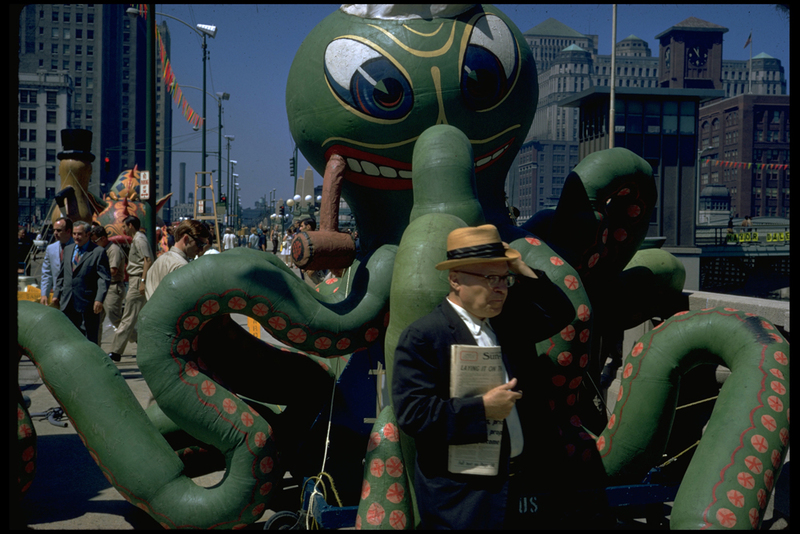 CA) Simultaneously, on the South Side at the University of Chicago’s Smart Museum, there is an exhibit called Monster Roster: Existentialist Art in Postwar Chicago [Until June 12]. Related to that, there is an exhibit called The Next Generation: Chicago Imagists from the Smart’s Collection. Paschke’s work is highlighted along with some others. And on March 11, the University of Chicago’s Reva and David Logan Center for the Arts is hosting A Night With Underground Imagist Filmmaker Tom Palazzolo. What’s behind all the attention you’re receiving again? PALAZZOLO) I’m not sure. It’s great, it helps make these winter months more interesting, having to get ready for these shows. I don’t know why I’m somehow being revived. CA) You’ve made more than 50 films since the mid 1960s. Your latest, which is still in progress, is about the late Chicago artist Lee Godie, entitled Lee Godie, Chicago’s French Impressionist. When will the film be completed? PALAZZOLO) I’m not sure. Here’s the thing, I’m working on it with a friend who’s very thorough — Kapra Fleming. We’ve interviewed at least 20 people for the film. She [Godie] was the most collected artist that the city has ever seen. Literally hundreds of people have her work and most have a funny story about her. I have a clip of an interview of someone who went to see her at the Toyko Hotel. They had a nice visit, but then she said she wanted to do a portrait of him. He agreed and then she moved closer to him and said, ‘You know, I can do the lips much better if you give me a kiss.’ [Laughs] I have all kinds of eccentric stories about her. She’s a great story, a survivor who had things turn out well for her in the end. She had a lot of shows and attention and was able to charge pretty good money for her work. Early on of course, she was only charging $10 per piece. CA) Wasn’t she homeless for a long period? PALAZZOLO) She sure was. She would sleep out in cold weather. She was very eccentric. Every once in awhile people would convince her to stay at a fleabag hotel. But she often slept out in the cold and kept her stuff in storage units or lockers at the Greyhound Bus station and places like that. CA) Did you know her personally? PALAZZOLO) I didn’t. I tried to film her once and she got very mad at me and chased me away. My wife [artist Marcia Palazzolo] bought a picture from her once and we had to sell it years later because we needed the money for a new furnace. It sold for a couple thousand dollars. CA) Lee has been dead since 1994. Did you have old footage of her? 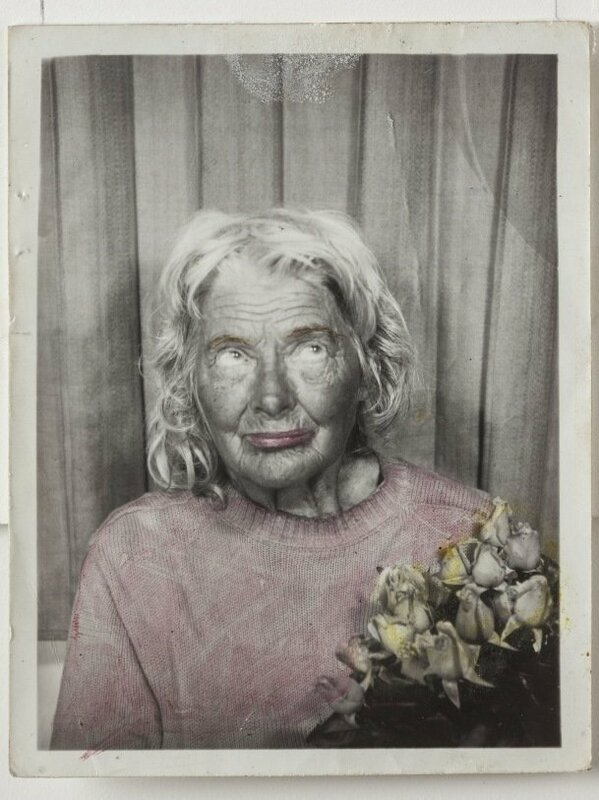 LEE GODIE, UNTITLED (PHOTOBOOTH SELF-PORTRAITS), COLLECTION OF ROBERT PARKER AND ORREN DAVIS JORDAN, NM. CA) When will the film be totally completed? CA) One of your early films – Pigeon Lady – was hailed by Roger Ebert as “A masterpiece” and “One of the most moving experimental films I’ve ever seen.” Was that a breakthrough moment for you? PALAZZOLO) I suppose it was. You know, several things helped. I also won a few awards over the years. All of that helped give me some confidence to get out there and do more. Roger was a real champion of me. Thanks to him I had many shows and was introduced to many groups. I got to show the work and get paid a little. He even convinced Studs Terkel to interview me. Roger brought Studs to my humble studio but Studs seemed more interested in Roger at the time. He couldn’t understand my experimental film “O.” It used experimental music and double exposures and Studs couldn’t make heads or tails out of it. He was a very sweet guy who I ended up meeting several times. He was also very generous. The 1960s were a great time for me. One of the places I got to, in 1968, the U.S. Information Service wanted to show American films in the Middle East. They wanted to show how free America was by showing experimental films. So I got to travel and me and my wife had sort of a honeymoon. She joined me in Beirut and we went to Israel also. I went as far as India and Sri Lanka. It was an eye-opening trip for me to see these other cultures. The funny thing is, the reason they chose me is because they thought if they chose a filmmaker from New York or L.A. or San Francisco, they would be too sophisticated and would speak out against the Vietnam War. They wanted a yokel from the Midwest. Of course they didn’t know that I marched in 1966 with a group of artists in protest against the war and marched with Martin Luther King, Jr. The 1960s were definitely a most interesting time. I went to the School of the Art Institute. One of my influential teachers was Ken Josephson. It was great to be attached to an American museum with all the resources and shows it had. It was also inexpensive to go to school. Now it’s $30,000 a year to go, I can’t imagine that. It was very cheap when I went. I didn’t have to get any loans. I could find part-time jobs to pay for tuition and a cold-water apartment. I did a film about my apartment [Down Clark Street] which was near Clark and Hubbard Streets. It wasn’t a cold water flat, but the landlord would turn the heat off at 10 p.m. every night and turn it on in the morning. I almost froze a few nights. But every artist should have a bohemian experience. It made it very interesting. 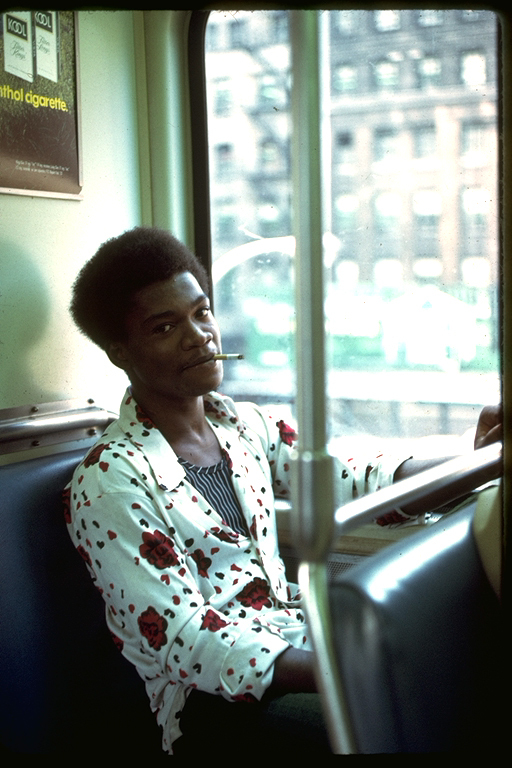 Young man smoking on the el, 1972. Digital image from a 35mm slide by Tom Palazzolo. CA) In the 1980s independent film makers were switching to video because of the rising cost of film, but you didn’t make the jump. Why not? PALAZZOLO) First of all, I had a connection. I was able to get film inexpensively from people who worked in the news. I got to know the news cameramen at a lab. They would go out and shoot a story but they would have a lot of leftover film. They’d have a 400-foot roll of film which is about 12 minutes and shoot a story that was at the most 5 minutes. Then they would take it to the lab and have it developed. The stations did not want them to use the leftover film, they wanted them to use fresh rolls, so for example I’d pay them $5 for $30 worth of film. I certainly played the behind the scenes game, doing favors, shooting weddings and things like that. I wasn’t always on the up and up but I got a lot done. CA) How long did you stick with film? PALAZZOLO) Probably until the 1990s. I had a lot of equipment that I ended up selling. CA) Do you have a digital camera that you use now? PALAZZOLO) I do, I have a cheap one but for this film on Lee Godie, we are using Kapra’s camera. CA) You taught at Chicago City Colleges from 1966 to 2002 and at the School of the Art Institute of Chicago from 1976 to 1990. That’s how you paid your bills? PALAZZOLO) That’s exactly how I paid my bills. I had a few good years with my art and won some grants, I had to teach. CA) What was the best thing about teaching? PALAZZOLO) I really liked my students. It’s really great working with young people, they are fresh and they are not jaded. I tried to be a good teacher and help them. Many of them are still friends of mine. “Pre-occupied man, Wacker Drive,” 1975. Digital print from a 35mm slide by Tom Palozzolo. CA) You’re now 78-years-old, correct? CA) Do you have a camera with you when you leave your house? PALAZZOLO) I used to do that, but don’t anymore. I’m too embarrassed to walk around with a camera nowadays when everyone has their cell phones, which take terrific pictures. I think I’d look a little archaic. And the truth is, most of my cameras are broken. I do have a video camera that I’ve had for about a year but I’m still trying to figure out how it works. I’m not all that interested in learning new tricks, new technology at this point. I’m lucky that I can send an email. CA) You’ve seemed to always be attracted to the oddballs and the seedier side of things. What has inspired you all these years? PALAZZOLO) It’s certainly been the environment that I’ve found myself in, and the fact that the people that I’m attracted to are accessible. They are open to being photographed and have interesting stories. I’ve asked people like Mike Royko for cooperation because he had a waiting room full of eccentric people with crazy stories. I tried to get permission to film his little waiting room, but every time I’ve ever tried to ask A-list people for permission to film things, they’ve said ‘Absolutely not.’ But you know, they have enough attention and they aren’t that interesting.